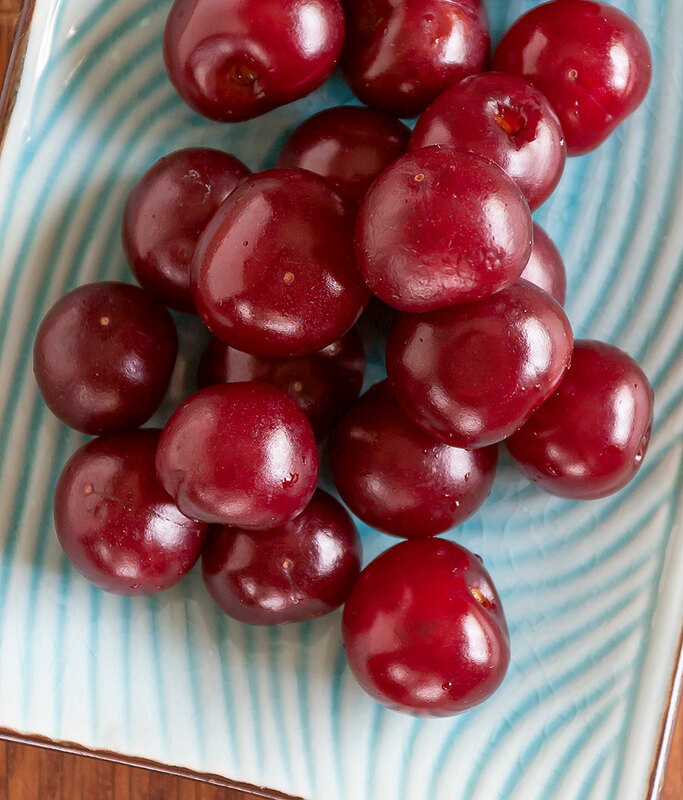 What’s the first thing that comes to mind when you think of tart cherries? Cherry pie? Cherry cobbler? Cherry jam? 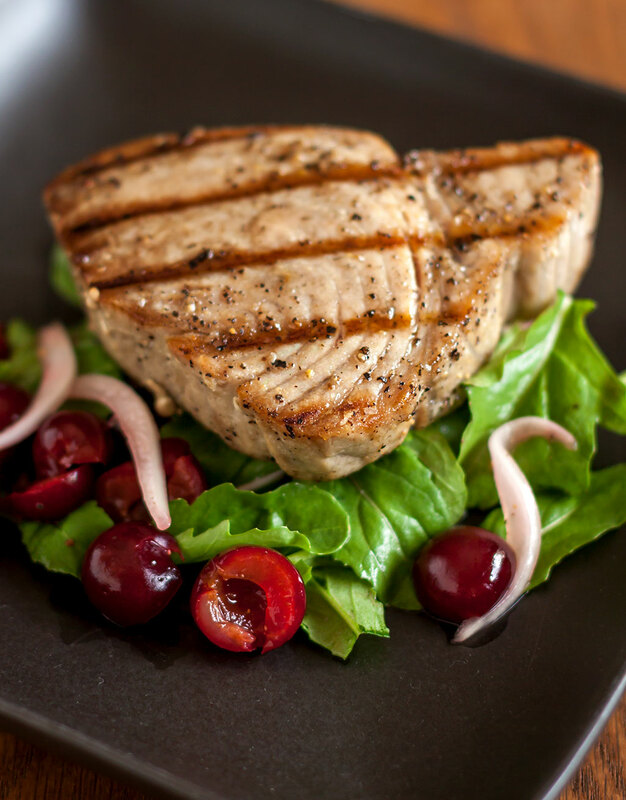 Think again; a juicy grilled tuna steak might not seem to be a likely pairing for fresh cherries, but the lively flavor of the Balaton cherry is big enough to take on the job. A meaty fish like tuna (or for that matter, salmon, halibut and cod) cries out for a generous dash of acidity to balance all that oily richness. The answer? A bold combination of tart Balaton cherries, peppery arugula and sweetly pungent Walla Walla onions, supported by the bright tanginess of honey-infused vinegar. This dish, utilizing seasonal ingredients, is ideal for a quick and easy summer meal. All the cooking is done out on the grill, so there’s no need to heat up the kitchen. All of the other elements – the cherries, onion and arugula – can be quickly assembled with little fuss and are simply tossed together right before serving. Our recipe features moist and meaty tuna steak, but the robust flavors of the cherries & co. are easily equal to pairing with grilled pork or a juicy lamb chop. In a medium bowl, toss the onion with the vinegar and 1 tablespoon of the olive oil. Set aside. Prepare the grill and preheat to medium-high. Drizzle the remaining 1 tablespoon of olive oil over the tuna, turning to coat both sides. Season generously with salt and pepper. When the grill is hot, add the tuna steaks and cook until medium rare, about 2 – 3 minutes per side. Remove from the grill and allow to rest for 5 minutes. Toss onion mixture, cherries and arugula together with a pinch of salt and pepper. Divide between two serving plates and top each with one portion of the grilled tuna and serve. It’s a bold combination indeed, but it looks like it works perfectly. Gotta give it a try one of these days! Thanks, Diana. It does work very well indeed. Highly recommended!